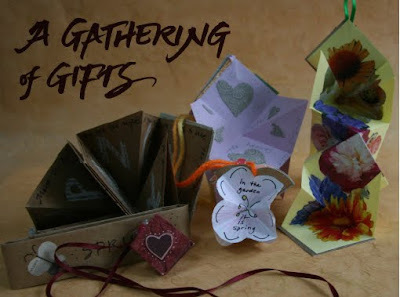 The second Gathering of Gifts workshop at the Center for Creative Wholeness in Newbury, MA will be taking place on Saturday, February 11 from 10 AM to 12:30 PM. We'll be making diamond fold books which are a special treat. They look complex but are easy to make. Once you learn how to make the folded sections, you can combine them to make accordions, stars, and necklace books. The fee for the workshop is $30. There is more information about the workshop in this pdf. Oh the diamond floral book is beautiful! What an interesting fold...and yes, it seems so complex.